A group of adventurers are planning on retracing Ernest Shackleton’s first expedition to the Antarctic in honor of the expedition’s 100th anniversary. The Matrix Shackleton Centenary Expedition will recreate history by crossing Antarctica precisely 100 years after Ernest Shackleton made his attempt in 1908. Although it set a record at the time, Shackleton fell short of reaching the South Pole by 97 miles. He was forced to turn back in order to save the lives of his men from hunger and physical exhaustion. After returning home, Shackleton remarked to his wife: "Better a live donkey than a dead lion." Now, a team of descendents from the 1908 expedition, including Patrick Bergel, great-grandson of Ernest Shackleton, will retrace the footsteps of their ancestors in order to finish the job and reach the South Pole. Just like the original expedition, the team will first climb Mount Erebus, the world's most southerly volcano. Then on October 29, 2008 at 10am, exactly a hundred years to the day since Shackleton and his men set out, the team will depart from the Shackleton Hut at Cape Royds. Travelling unguided on skis, and hauling their own expedition supplies in sledges, they will cross the Ross Ice Shelf, the Beardmore Glacier, and then 400 miles across the Polar plateau to the South Pole. In total, the Matrix Shackleton Centenary Expedition will travel 900 miles in roughly 80 days. They expect average temperatures of around -75 degrees, and winds that can regularly reach 120 miles per hour. Interestingly, Ernest Shackleton is most famous for his doomed 1914 - 1916 expedition to the Antarctic. His ship, the Endurance, became stuck in an early ice floe, forcing Shackleton to order the ship to be wintered in the frozen sea. The men lived within the ship for several months before the ice destroyed the ship, forcing the expedition to live out on the ice. Two months later, they built sledges and moved to Elephant Island. No one knew what happened to the expedition or where they were. In fact, most people assumed they were probably killed. Knowing that a rescue wasn’t going to happen, Shackleton made the call to take one of the open lifeboats across 800 miles of frigid sea to South Georgia Island where a small whaling station was located. Incredibly, he landed on the wrong side of the island and was forced to trek over the frozen mountains to reach the station. 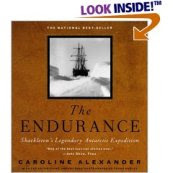 Because this expedition occurred just as World War I was beginning, this amazing story of courage, heroism and survival was largely forgotten until Caroline Alexander published her excellent book about the subject in 1998. If anyone is interested in Arctic exploration or survival stories, I highly recommend this truly riveting book. HikingintheSmokys.com Detailed information on trails in the Smoky Mountains; includes trail descriptions, key features, pictures, video, maps, elevation profiles, news, hiking gear store, and more. To order a copy, please click here. You can also click here to read a short excerpt from the book, or click here to read a review from the National Parks Traveler. Are cell towers in the Smokies a good idea? Are bear encounters on the rise in the Smokies?